The 15-glove notrile Pearl Colour System gloves range, helps organisations across the food, health, hygiene, care homes and facilities management sectors more effectively manage cross contamination risks. The range, combines high quality, AQL 1.5 medical grade, powder-free nitrile gloves available in a range of colour finishes - including those recognised in the British Cleaning Council’s Guidelines for four colour coding - designed to effectively implement colour coded barrier protection and cross-contamination prevention measures. All fifteen Pearl nitrile gloves are suitable for use with all food types, including fatty foods and therefore are ideal for use in the food manufacturing, processing and handling environments where the use of colour coding is proven to combat the risks associated with cross-contamination. 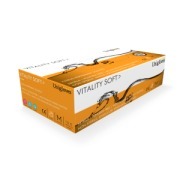 Benefiting from Unigloves’ proprietary extended hand-crafted manufacturing process, the Advanced range of gloves are significantly easier to don and remove without irritating the skin. Fortified is Europe’s first antimicrobial and anti-bacterial nitrile single use glove, created by Unigloves® and antimicrobial technology specialist BioCote. 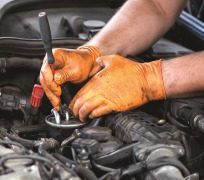 Unigloves PRO.TECT heavy and ultra heavy-duty gloves - the UK’s leading automotive glove range. PRO.TECT ORange HD features DiamondGrip Technology on the inside and outside with a diamond texture for maximum grip, even when working with oil and grease. Our Select Black gloves are a range of black, single use gloves, designed and engineered by Unigloves and supplied to tattoo artists around the world. The Unicare single use glove range has been developed especially to provide exceptional levels of comfort. Available in nitrile, vinyl, vinyl/nitrile blend, latex and polythene, the gloves are medical grade, for use in medical applications, dental and veterinary care. 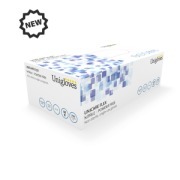 Single use hand protection specialist Unigloves has enhanced its food-dedicated range with the launch of the new Unicare Flex Nitrile disposable glove.